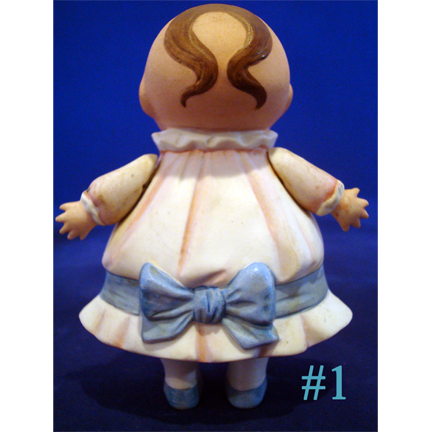 These adorable, roly poly all bisque dolls have highly characterized facial features, each with single forehead lock of curl, painted googly downcast eyes with white eye dots, smiling expression with beaded teeth, sculpted costumes, jointed arms. 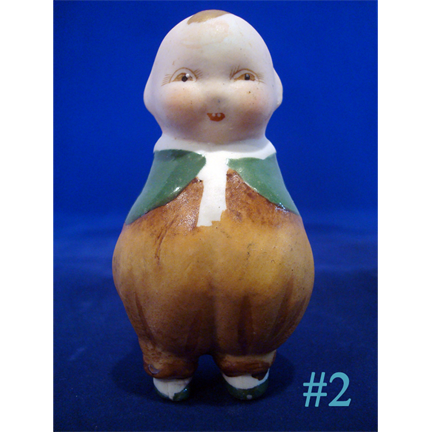 They were made in Germany, circa 1915, for Borgfeldt, based upon the illustrations of Kate Jordan, trademarked as Mr. and Mrs. Happifats. 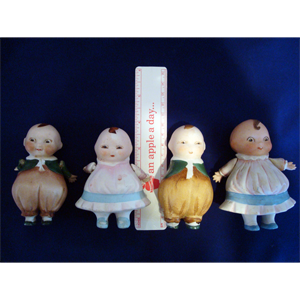 They were later produced by Nippon in Japan. Their condition is generally excellent with details below. 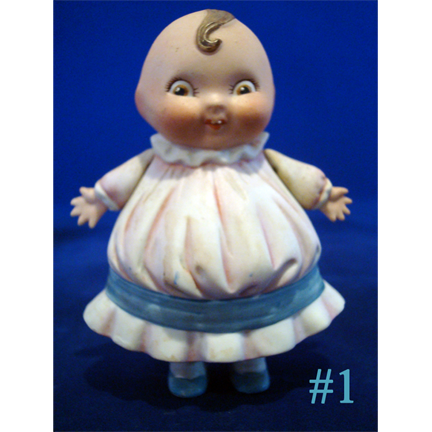 Doll #1 Mrs Happifats is 4″ tall and in excellent condition. 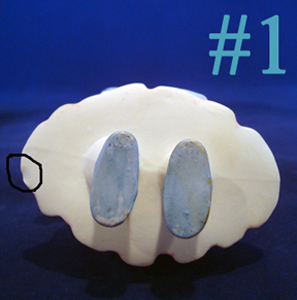 She does have a small chip at the edge of her skirt as noted in the picture. She is not marked, but is probably German. 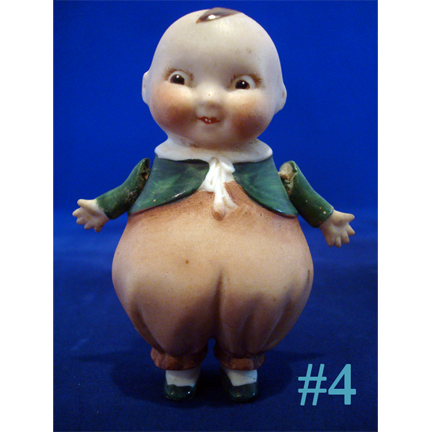 Doll #2 Mr Happifats is 3 3/4″ tall and is in great condition, but sadly is missing his arms. 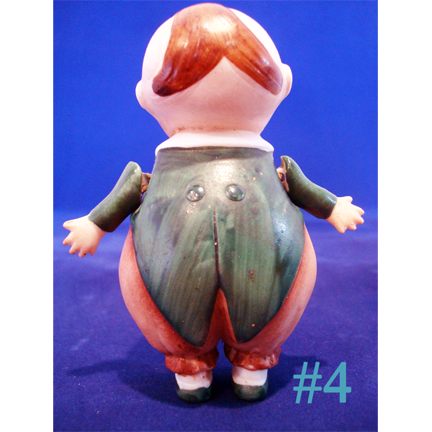 He is unmarked, but probably Nippon. 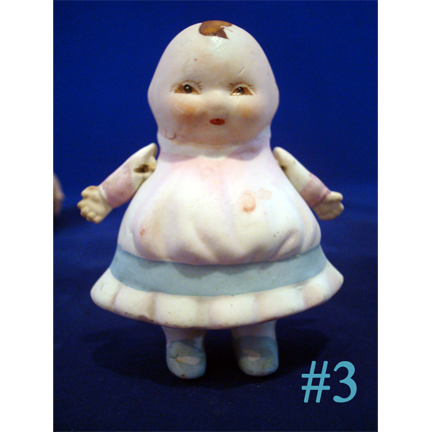 Doll #3 Mrs Happifats is 3 1/2″ tall and in great condition. She is unmarked, but probably Nippon. 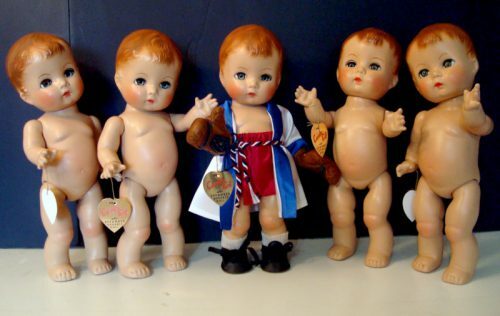 These darling rotund, comical boys and girls with round, down glancing eyes, have two tiny teeth; molded forehead hair locks; and a chubby body with molded clothes. 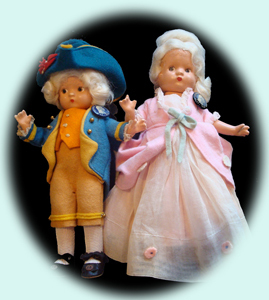 The dolls were originally made in cloth and were meant to compete with the popular Kewpie dolls. 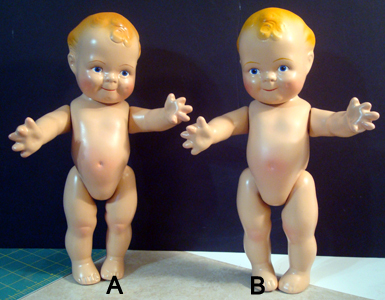 These dolls eventually were produced in three sizes, and one version was made with a composition head.